Elevated intraocular pressure (IOP) is the best recognized risk factor for the pathogenesis of glaucoma and the extent of retinal ganglion cell (RGC) degeneration in glaucoma is closely correlated with the extent of IOP elevation. Therefore, accurately and reliably measuring IOP is critical in investigating the mechanism of pressure-induced RGC damage in glaucoma. However, IOP is typically measured under general anesthesia in most studies using mouse models and many anesthetics affect the IOP measurements in both human and animals. 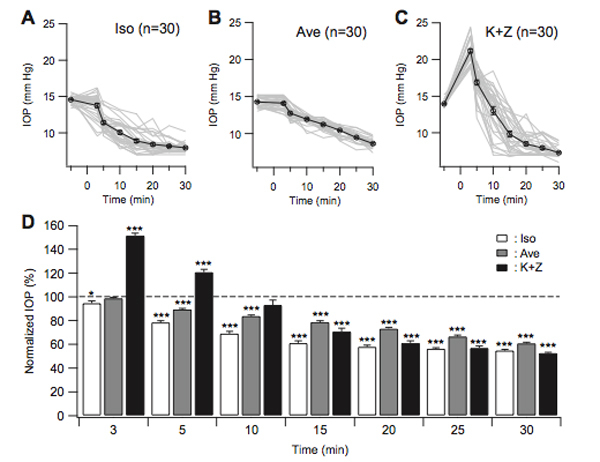 This paper by Ding C, Wang P and Ning Tian characterized the effects of behavioral training and several commonly used general anesthetics on the measurements of IOP of mice with normal and elevated IOP. The results demonstrated that the IOP measured from awake mice after behavioral training most accurately and reliably reflects the actual IOP and provides useful guidelines to avoid the artifacts due to the use of general anesthetics. The results described in this paper were largely generated by Dr. Chun Ding, who was an exchange graduate student from The Second Xiangya Hospital, Central South University, China and currently an ophthalmologist of The Zhejian University, China.